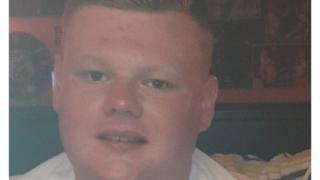 Police have named the man killed in a stabbing attack in east Belfast as 21-year-old Reece Leeman. The PSNI received a report of the incident on Kyle Street, Sydenham at 1:50 GMT on Friday morning. Mr Leeman collapsed on Connsbrook Drive and was taken to hospital where he died from his injuries. A 28-year-old man arrested on suspicion of murder remains in custody, while an 18-year-old arrested on the same charge has been released unconditionally. The teenage male was later re-arrested on suspicion of aggravated burglary and robbery and remains in custody. It is understood Mr Leeman was the nephew of footballer Tommy Leeman, who played for Glentoran and Glasgow Rangers in the 1980s. On Twitter, Larne Football Club wrote: "The club would like to pass on our sincere sympathy to former manager Tommy Leeman on the loss of his nephew Reece." Det Insp Joanne Harris said: "My thoughts today are very much with Reece's family and friends who are trying to come to terms with their sudden loss. "Our investigations continue and I am following a number of lines of enquiry. "At this time, however, I can say we are not seeking anyone else in relation to Reece's death but I do want to make a number of specific appeals in a bid to piece together Reece's movements in the final hours before his untimely death. "I know Reece had gone to an address on Kyle Street with another male sometime before 1:50 GMT. "Some type of altercation occurred inside the house when Reece was there. He was subsequently discovered collapsed on the street on Connsbrook Drive with stab wounds." Anyone who saw Reece the day before the attack in the area, or with another man, has been asked to contact police. DI Harris added: "No matter how insignificant you think the information you have is, please contact us. Your information could be key to our investigation." "Anyone with even the smallest scrap of information needs to help them keep our community safe."